Visualize your applicants with colorful tiles you can simply drag and drop through your hiring workflow. It works as easy as sticky-notes on a whiteboard! View the board as large or small tiles, or as a list. Group and sort your jobs by name, status or company. 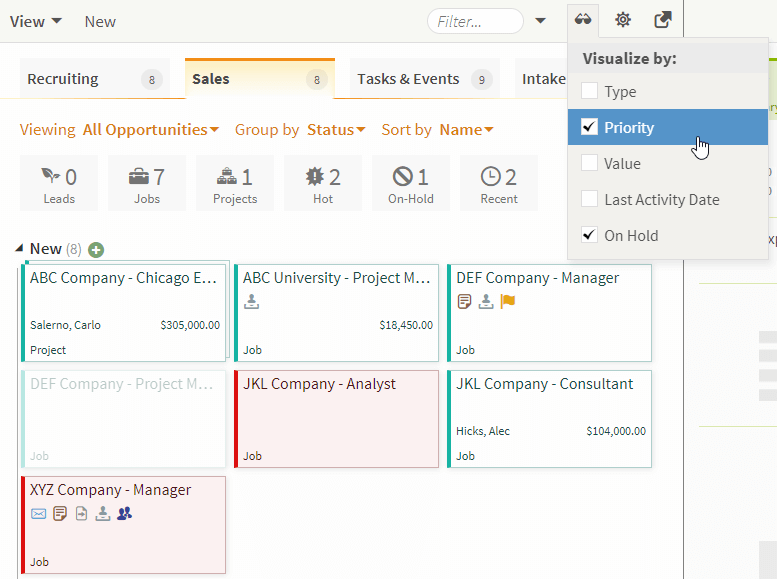 Customize the board based on how you work your candidate pipeline. Job Tiles give you relevant, at-a-glance data about your jobs and offer a quick way to view all associated activity, calendar appointments and referral sources. Easy and Intuitive. Work’s exactly the way you want. Contacts are immediately updated so that placement progress is always current. Select one contact or many to move through your pipeline. Drag and drop allows you to easily manage complex pipelines at the click of your mouse. Deep dive into candidate profiles and get the information you need immediately. With over 75 standard and 30 customizable fields, your candidate profiles have exactly the information you want, where you want it. Add resumes, interview notes, and other support documents. 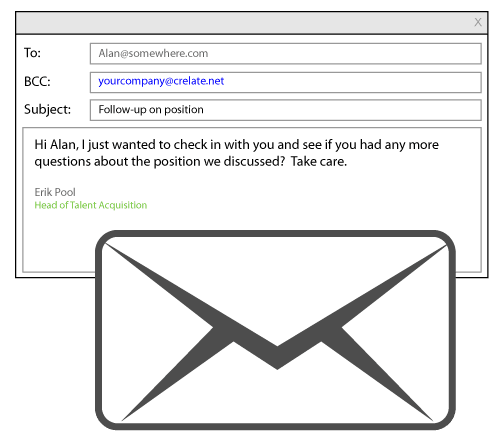 Email candidate directly from profile. 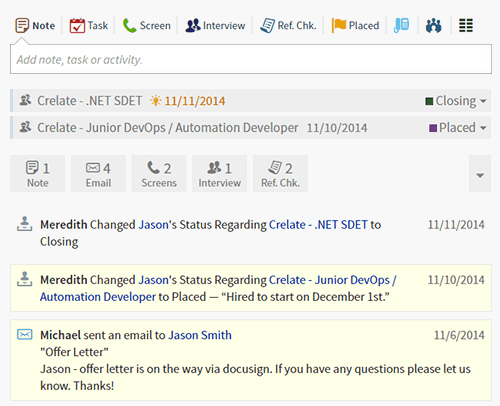 Notes and activities are continually updated as your candidate moves through your workflow. Candidate profiles are rich, informative, and deeply customizable. Have all the information you need to get that placement. Visualizations help you visually sort the current status of your pipeline so you can gain immediate insight. Visualizations give you immediate actionable insight so that you can be as efficient as possible. Crelate makes it simple to track all your interactions with contacts. It takes only a few clicks to track a conversation you had with someone. 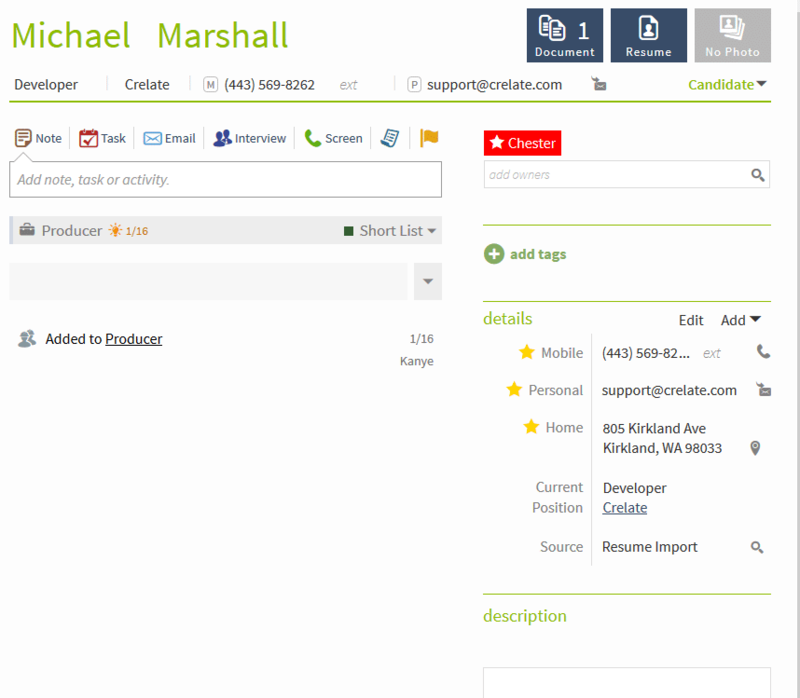 Quickly view job, contact and company activity. Customize existing activity types, or add your own. Schedule future activities and follow-up reminders. Pin important notes to the top of the contact to improve visibility. Mention another record in your notes to link the two. Need to change a Phone Screen to an Interview? No problem! Tasks are the sure way to ensure that nothing slips through the cracks. 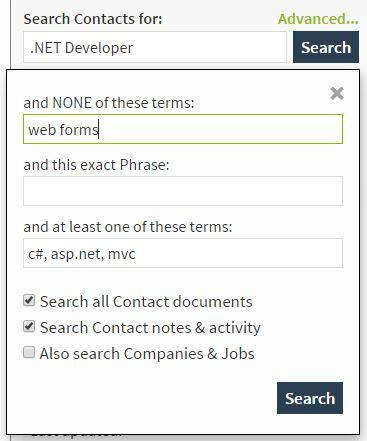 Crelate comes with blazing fast full-text and relational search capabilities. Build simple or complex Boolean queries, search by tag, proximity across 10’s of thousands of records in fractions of a second. Crelate loves email! Without the need for addins or extra applications you can add contacts, parse resumes and vCards, and track your conversations all within the system.